One of the best books on the 1972 Summit Series is now on available as an ebook. Cold War: The Amazing Canada-Soviet Hockey Series of 1972 is newly re-released available on Kindle for just $9.99. Roy MacSkimming is a gifted Canadian writer, as proven in the book Cold War. He attempts to re-capture much of the drama, suspense and symbolism of both the on ice action and off of it. Of course, it is nearly impossible to truly relive the era, especially to audiences that never lived through it in the first place. Even it has become even harder to explain to newer generations as the world in 1972 is as foreign to them as the Soviet players were to us.. Regardless, MacSkimming comes as close as anyone has in reliving the series in it's original context as anyone has in print. The book definitely serves as a definitive history of the 1972 Summit Series. Factually the book is very solid. The author also stretches a bit and attempts to reveal the impact on the players, on North American hockey and on Canadian culture in general. 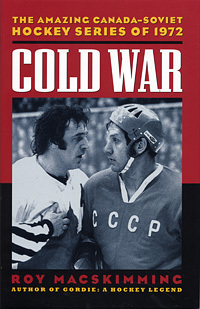 If you are to read only one book on the 1972 Summit Series, make Roy MacSkimming's Cold War.